This article is about three of the most successful managers in boxing today with all living in the US but two not born here. They are all active in boxing with great boxers. We have David McWater, living in NYC, Egis Klimas from Lithuania living in WA & Vadim Kornilov from Russia living in L.A. This writer met McWater in Philadelphia when one of his now thirty-six boxers was on the fight card. From Philadelphia welterweight “The New” Ray Robinson, 24-3 (10), is ranked boxer at No. 11 in the IBF. Another Philadelphia boxer on his list is welterweight Mark Dawson, 4-0-1 (1). A most recent signee from that city is Poindexter Knight, Jr. 2-0 (2), who was the 2017 Golden Gloves champion. McWater’s boxers come from all parts of the world such as Legor Plevako, 5-0 (3), of the Ukraine. Three are from Uzbekistan such as cruiserweight Botirali Mamajonov, 5-0 (3), living in West Palm Beach, FL. The other is middleweight Hurshidbek Normatov, 5-0 (2), living in Brooklyn, NY. Middleweight Botirsher Obidov, 6-1-1 (2), is living in Kissemee, FL. From Honduras is their 2016 Olympian Teofimo Lopez, 8-0 (6), living in Davie, FL. From India and fighting out of his home country is Neeraj Goyat, 9-2-2 (2), from Chandigarh and also from India two-time Olympian Vikas Krishan. From Senegal is Boubacar Sylla, 9-0 (7), living in Cincinnati, OH. Finally from Russia is Super lightweight Ivan Bartwchyk, 18-0 (11), living in Miami, OK, on national TV defeated Philadelphia’s Keenan Smith, 11-0 and Petr Petrov 38-5-2 on Showtime. He is No. 4 in the IBF having won the USBA title in 2017. Some of the more experienced boxers are Wesley “King Wes” Tucker, 14-2 (8), a southpaw super welter from Toledo, OH, Antonio “Carita” Nieves, 17-2-2 (9), a bantamweight from Cleveland, OH, Christopher Pearson, 14-2 (10), a super welter from Trotwood, OH, heavyweight Darlington Agha, 10-1-1 (7), from Sugar Land, TX, Joe Williams, 12-0 (8), a cruiserweight from Far Rockaway, Queens, NY, Isaiah Steen 10-0 (8), a super middleweight from Cleveland, OH, Michael “The Silverback” Moore, 15-1 (7), a middleweight from Cleveland, OH. Also 2016 US Olympian Antonio Vargas, 6-0 (3), living in Kissimmee, FL, and 2016 Olympian Charles Conwell, 7-0 (5), of Cleveland, OH. Possibly the best known manager in the business is Lithuanian Egis Klimas living in Edmonds, WA, who has the P4P best boxer in the world in WBO Super Featherweight Champion Vasyl “Hi-Tech” Lomachenko, 10-1 (8), of the Ukraine. All 15 of Klimas’ boxers are born outside the US. Other world champions he has are Ukraine’s Oleksandr Usyk, 14-0 (11), the WBC and WBO Cruiserweight Champion and Russian Sergey “Krusher” Kovalev, 32-2-1 (28), WBO Light heavyweight champion and Bakhram Murtazallev, 12-0 (10) IBA Super Welter champion. From KAZ are Super Welter Madiyar Ashkeyev, 9-0 (5), Middle Meiirim Nursultanov, 6-0 (5), and Super Feather Ashkat Uallkhanov, 2-1 (2). From Russia are Welter Alexander Besputin, 9-0 (7), Welter Maxim Dadashev, 9-0 (9), Heavyweight Gasan Gimbatov, 3-1 (2) and Feather Evgeny Gradovich, 23-2-1 (9), who holds the WBA I/C title. From UZB is Super Light Fazllddin Galbnazarov, 3-0 (1). From Georgia is Welter Enriko Gogokhia, 7-0 (3). From Lithuania Egidijus Kavallauskas, 19-0 (16), NABF Welter champion. Vadim Kornilov is a manager/agent from Russia living in L.A. and has 11 current boxers and had actor Mickey Rourke, 6-0-2 (5). They include WBA Light Heavy Champion Dmitry Bivol, 13-0 (11), from KYR, living in Russia. He has Russians in WBO I/C Feather champion is Evgeny Chuprakov, 19-0 (10), Heavyweight Andre Afonin, 5-0 (2), Radzhab “The Python” Butaev, 8-0 (6), who won the NABF Super Welter title in 2016, Cruiser Alexey Egorov, 4-0 (3), Lightweight Gaybatulla Gadzhialiev, 5-0 (1), Heavyweight Sergey Kuzmin, 11-0-1 (8), Cruiser Denis Lebedev, 30-2 (22), WBA Super World Champion, and former WBO Super Light Champion Ruslan “The Russian Rocky” Provodnikov, 25-5 (18). From the Ukraine are the former WBA Super Lightweight Champion Viktor “The Ice Man” Postol, 29-1 (12), and Taras Shelestyuk, 16-0 (10) who won the WBO NABO Welter title in 2016. Egis Klimas – Hard Working Self-Made Manager & New Gym Owner! Egis Klimas is from Lithuania and after the German invasion of his country he ended up in the Russian Army for two years working on tanks. The International Rescue Committee is a refugee placement group who helped people like Klimas get out of war torn countries where persecution runs high. Klimas came to the state of Washington in 1989 and took on many jobs and through his hard work and determination has become one of the most successful managers in boxing. His good friend Don Turner (trainer of Holyfield and Holmes) has played a big part in the life of Klimas having a camp in North Carolina for boxers. “Best guy (Klimas) I ever met in boxing. He is the best manager in boxing today,” said Don Turner. “I met him when he first came over here and he is a class act and is going to be a power house in boxing,” said Don Elbaum. Turner being a well- respected trainer and advisor through Klimas took in Sergey “Krusher” Kovalev, at the start of his career who is now 30-1-1 (26), having lost his WBA, WBO and IBF in a highly disputed decision to Andre Ward. This writer had Kovalev ahead by five points. How the referee allowed Ward to initiate 46 clinches in a 36 minute bout is questionable. Turner and Klimas believed in Kovalev. 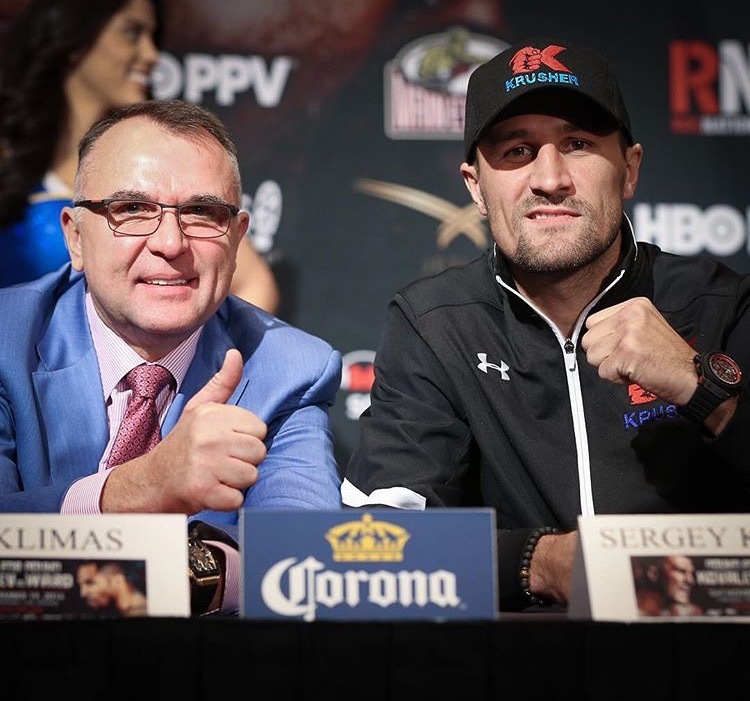 This writer believes Klimas has two of the three best P4P boxers in the world today in Kovalev and two-time Olympic Gold Medalist and WBO featherweight champion Vasyl “Hi-Tech” Lomachenko, 7-1 (5). 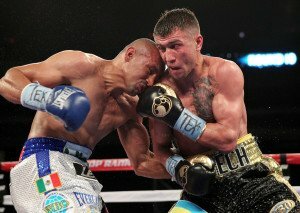 Lomachenko, 7-1 (5), fought for the vacant WBO world featherweight title in his second fight losing a split decision to Orlando Salido who was overweight forfeiting his title. He showed little interest in giving Lomachenko a rematch. When he did he asked Top Rank for an outrageous amount of money which tells you he didn’t want that rematch after all. Lomachenko knocked out Rocky Martinez for the WBO super featherweight title so now if Salido wants that title he will have to come to Lomachenko. Lomachenko was an incredible 396-1 in the amateurs only losing to Russian Albert Selimov whom he defeated twice afterwards. Lomchenko is scheduled to fight WBA champion Jason Sosa in a unification bout April 8th. Klimas works with fifteen boxers and co-manages a pair of Russians in Dmitry Mikhaylenko, 22-1, a welterweight and Vasily Lepiken, 19-1-1, a light heavyweight. Klimas speaks Russian, Lithuanian, English and some Spanish. He manages five boxers from the Ukraine, four from Russia, three from KAZ, two from LITH, and one from GEO. They go from heavyweight to featherweight. Besides Lomchenko he manages the WBO cruiserweight champion Oleksandr Usyk, 11-0 (10) of UKR. Klimas informed this writer that heavyweight Vyacheslav “The Czar” Glazkov, 21-1- (13), of the UKR, is back in the gym having been inactive since losing to Charles Martin in January of 2016 with an ankle injury. His other heavyweight is Oleksandr Teslenko, 8-0 (7), of the UKR, who just moved from Toronto, CAN, to Oxnard, CA, to train in the World Boxing Gym that Klimas recently opened. Teslenko is to fight February 24th in his US debut headlining at the Studio City, CA, event. Besides Kovalev, Klimas has another good light heavyweight in Oleksandr “The Nail” Gvozdyk, 12-0 (10), of the UKR, ranked No. 3 by the WBC, No. 6 by the WBO and No. 10 by the IBF. He currently holds the NABF title. He was 8-0 in the World Series of Boxing. He won a Bronze Medal in the 2012 Olympics. The three boxers from KAZ that Klimas has are middleweight Meiirim Nursultanov, 1-0 (0), super welterweight Madiyar Ashkeyev, 7-0 (3), and super lightweight Ashkat Ualikhanov, 1-1 (1), all living in Oxnard, CA. The one fighter from GEO is super welterweight Enriko “Gudan” Gogokhia, 3-0 (1). The two boxers from LITH, are super welterweight Virgilijus Stapulionis, 27-4-1 (19), and welterweight Egidijus Kavaliauskas, 15-0 (12), the No. 11 contender in the WBO, who Klimas is very high on. Klimas has four Russian fighters in Kovalev, super welterweight Alexander Besputin, 6-0 (5), who in the World Series Boxing was 3-0. Then there is super lightweight Maxim “Mad Max” Dadashev, 6-0 (5), and the former IBF featherweight champion Evgeny “El Ruso Mexicano” Gradovich, 22-2-1 (9), who was born in Siberia. As an amateur he was 126-24. He is scheduled to fight in Russia along with Mikhaylenko May 5th. Both will be scheduled for twelve rounds. In asking Klimas about the possibility of a Kovalev-Ward rematch he had this to say: Ward doesn’t want that fight. Kovalev said he would fight Ward anywhere including Oakland, CA, where Ward is from. Ward has a nine month max to give Kovalev a rematch. Klimas is a real go getter who has shown that hard work pays off!